At the end of May there is a Bank Holiday in the UK though really no one knows why or cares what for. 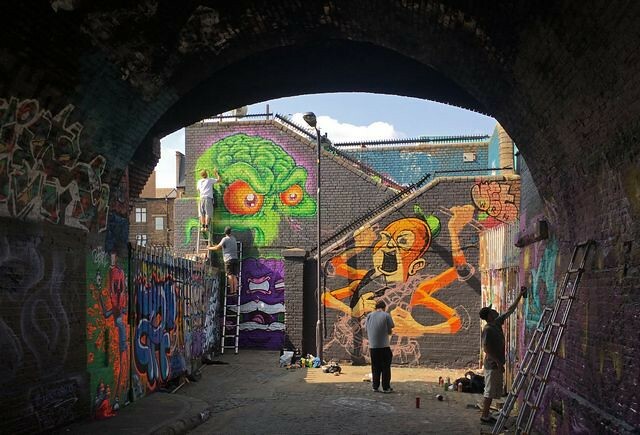 This provides a marvellous opportunity for a huge array of spraypainting talent to gather in Shoreditch for a frenzy of graffiti and art at the Meeting Of Styles Festival. 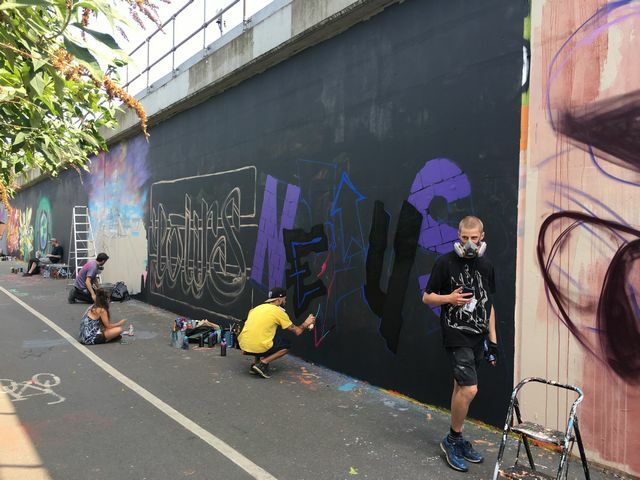 Meeting Of Styles is an international series of festivals which takes place in multiple locations around the world each year, this year 11 events are scheduled spread across the far east, South Africa and 6 cities in Europe. 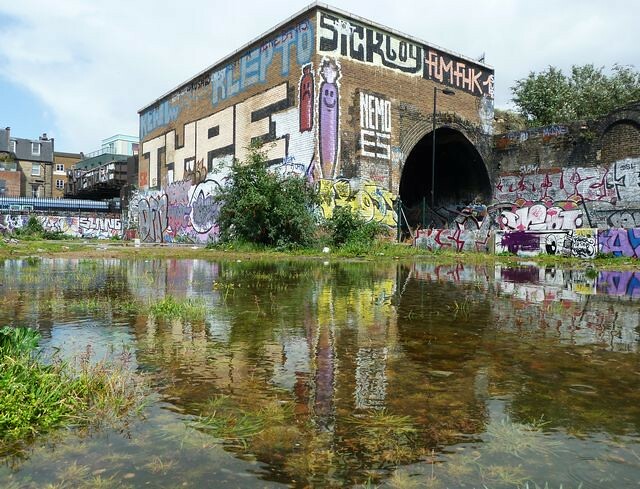 Since 2014 the London edition of MoS has found a home in the extraordinary Nomadic Community Gardens in Shoreditch. 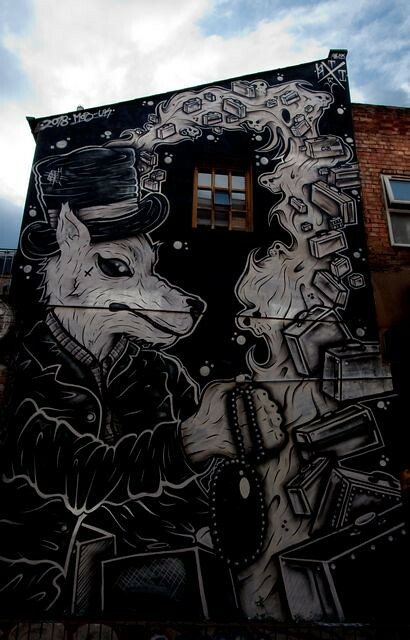 Its heart is a graffiti festival so let’s start with a peek at some of the letterbased highlights. Xenz embraced the opportunity to chip in a lower key wall after the intensity of his key role in the main wall last year; crumbling ruins overwhelmed by jungle vegetation and scarred by some apocalyptical flood trauma was a smash and guess what, the letters are buried in there! 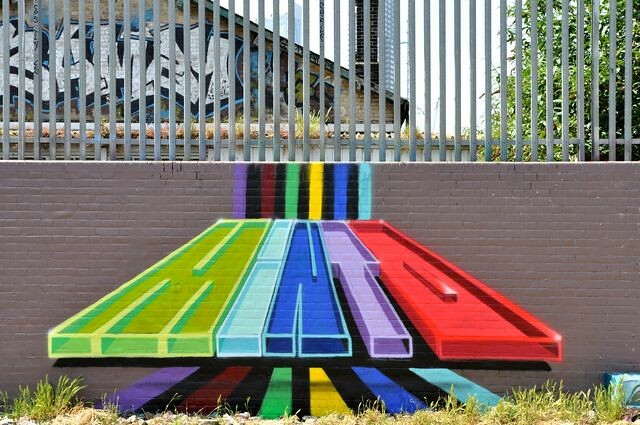 Minto’s colour perspective lines flow under his plastic letters, rise up the wall and soar off into the gridlines of the fence, a wonderful connection between art and location. Neist has an absolute frenzy scorching through his letters, breathtaking as always, go on – do it, you can find the letters in there. 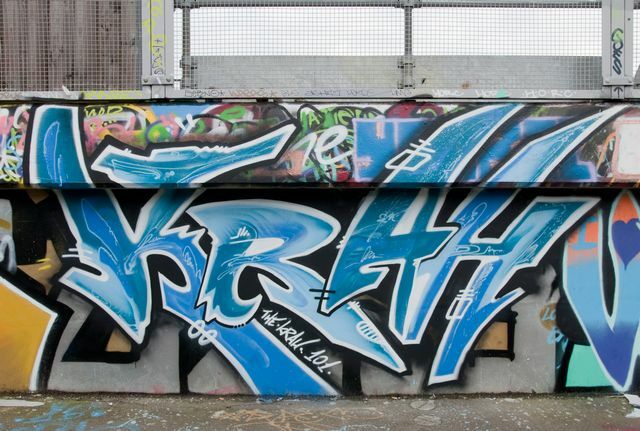 The Krah was seen just inside the Nomadic community Gardens entrance creating one of his swirling characters on a board but on the wall outside he left evidence of his origins in the early Athens graff scene, check out the flowing patterns and soft variations in hue across the fills inside these letters, skills that fans of his illustrative work might not be aware of. SkyHigh produced an awesome piece of writing with the letters written as if collaged from about a dozen different pieces. 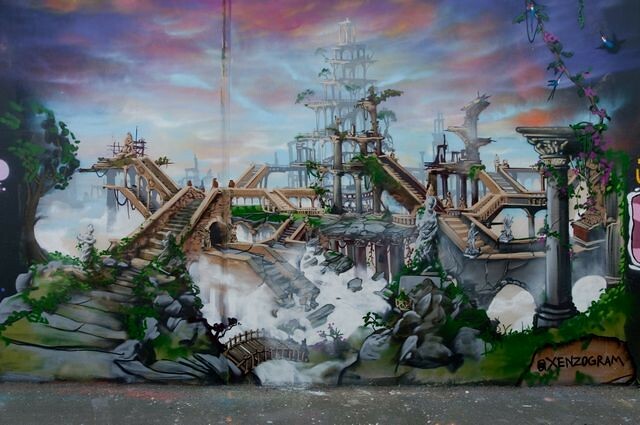 The main wall has gone progressively less graff in recent years, this year 8 artists have created a crazy computer screen on which the use of technology in the creative process is laid bare. 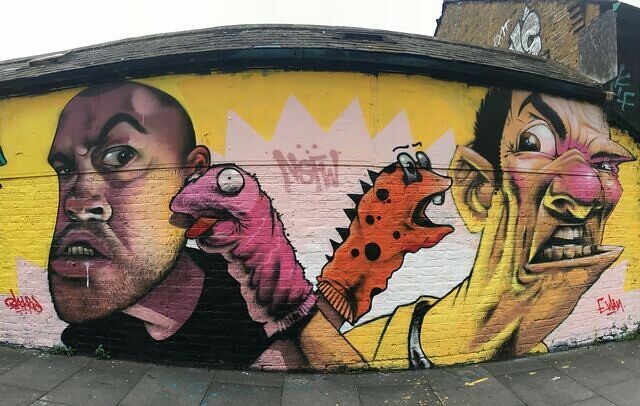 Carleen De Sozer pulled off a stunning wall in collaboration with Candie Bandita, what puzzles me is how did she know that I would photograph it with two biters next to me? 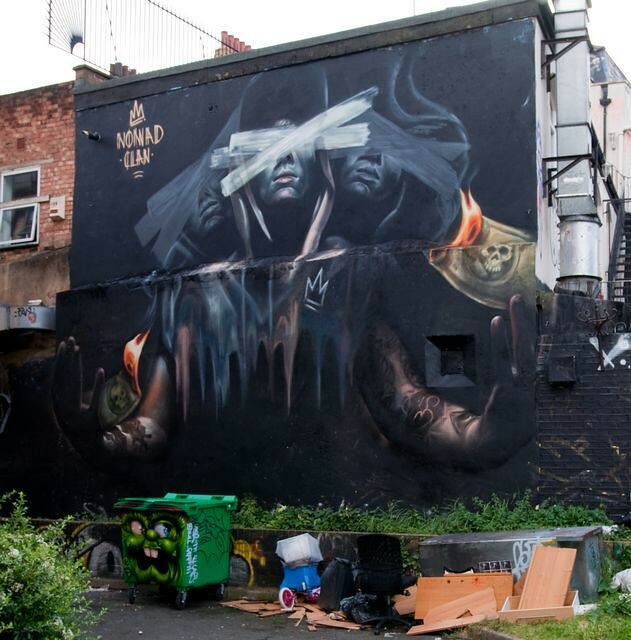 The only other time I have seen a Nomad Clan wall was an absolute banger they produced at Upfest in Bristol last year though this year trumps that experience as this time I saw the finished wall without scaffolding (three cheers for cherry pickers!). 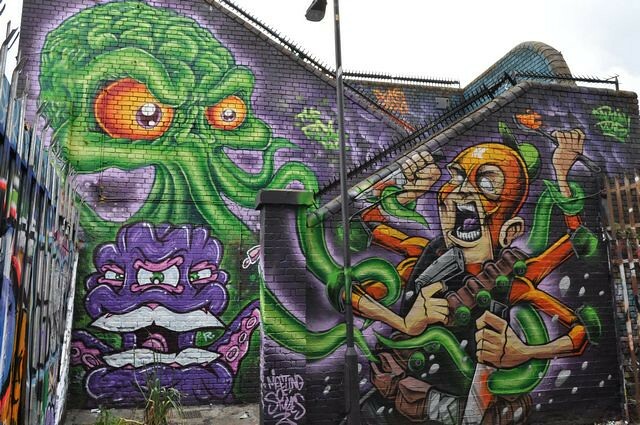 Poor 4-armed Captain Kris seems to have been disturbed in his kitchen by a pair of multi eyed squid from Dahkoh and The Real Dill, this fun piece cleverly uses the layers of walls around the steps to the bridge over the railway. Work in progress shot further down. 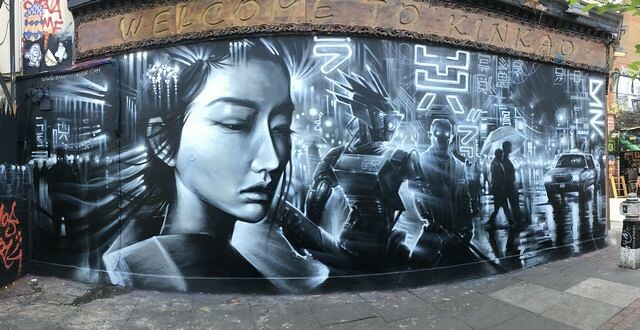 Dan Kitchener replaced his full on colour Kinkao Pedley Street wall with a monochrome piece. With large jams such as MoS it is fascinating how the little things that scream “not on the organiser’s who-paints-where list” catch the eye. 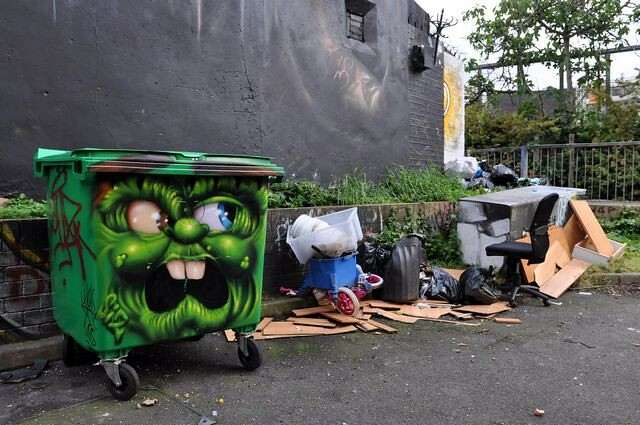 Si2’s characters on dumpsters raised a smile in several spots in the area, actually looking more spontaneous and less like an exercise in painting virtuosity than when seen on the mock train set up at last year’s Upfest in Bristol. 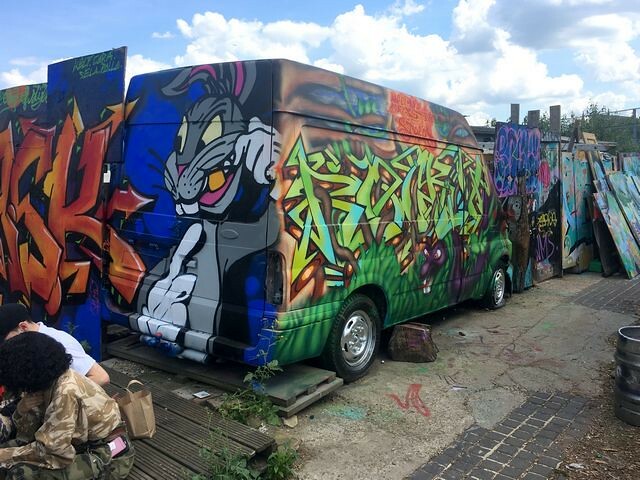 The UK Meeting Of Styles is organised by End Of The Line and a huge amount of credit goes to Jim Vision, Mattie, Tamara and the many volunteers also involved in keeping the show on the road. End Of The Line have steered the festival through a variety of locations and forms until it has become became the sun drenched (mainly!) spraypaint, food and music party fest it is today. 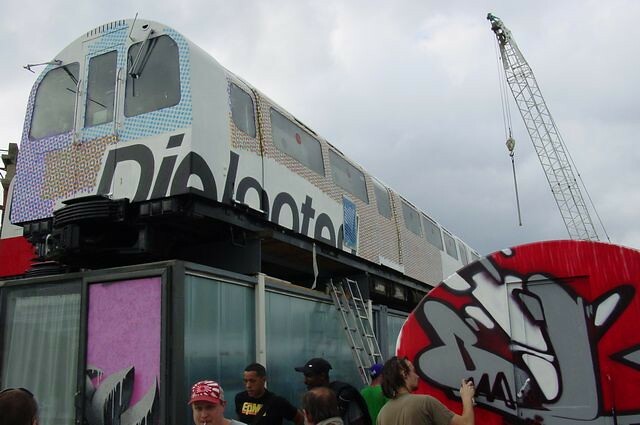 In 2008 London’s Meeting of Styles was held on the roof of Village Underground, it felt like small “insider” event with painting and music taking place on the static tube trains now serving as offices above Village Underground with the well known Village Underground Holywell Lane wall as the centrepiece feature wall. 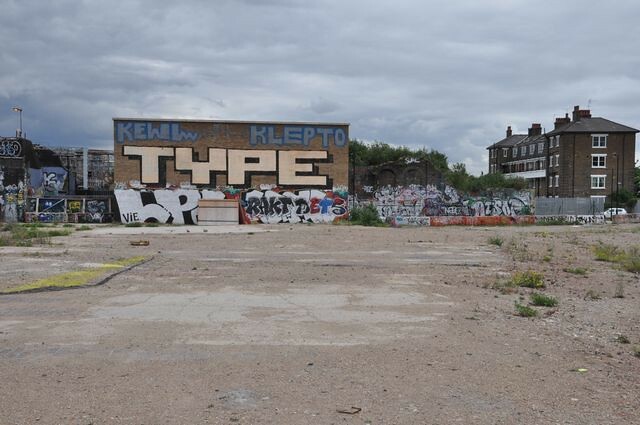 In 2009 the scale expanded dramatically; from a party base in a disused car park and industrial space on Paul St, now gone, to Sclater St, Bacon St and Bethnal Green Road which provided hundreds of metres of walls and a stage and sound system was set up in the Bacon St car park. So little of the structures painted back then remains. 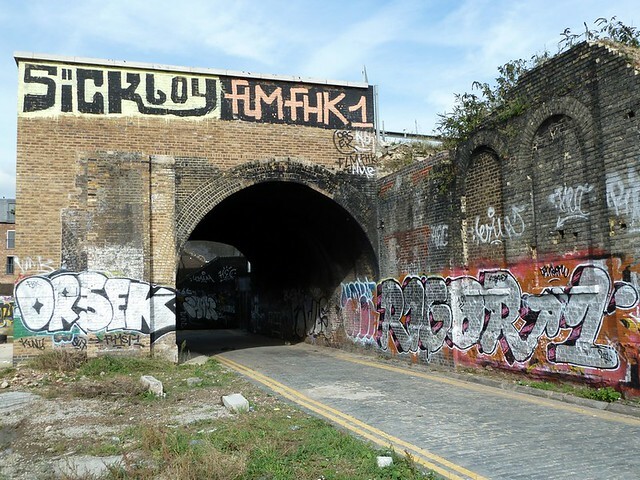 The festival moved up to Islington and I will confess to not attending either of those two years, then following a hiatus of a few years a pivotal move back to Shoreditch occurred. 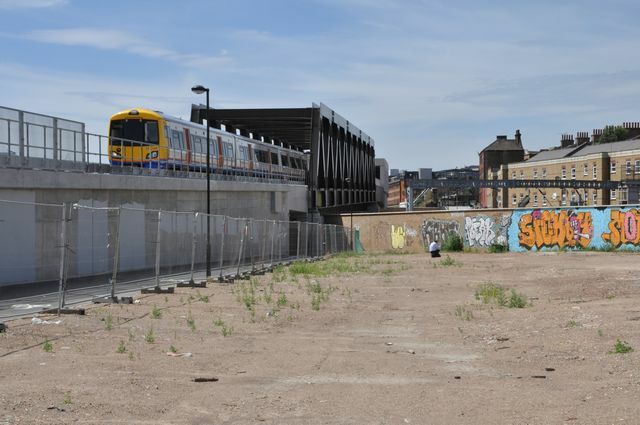 A pinched derelict piece of land trapped between two diverging sets of rail tracks had undergone a strange swap arrangement between two neighbouring land owners and while old owner Network rail fortified, patrolled and defended the barren unused plot – even us photographers were regularly hassled by police and security on the paths bordering the plot, the new owners welcomed community use. The land was rough and irregular with remnants of old foundations peeking through the crust, weeds sprouted between the cracks and is was prone to flooding. People loitering in the area were the kind of folk who didn't welcome close scrutiny, if you squeezed under the fence you certainly didn't waste time hanging around in there. 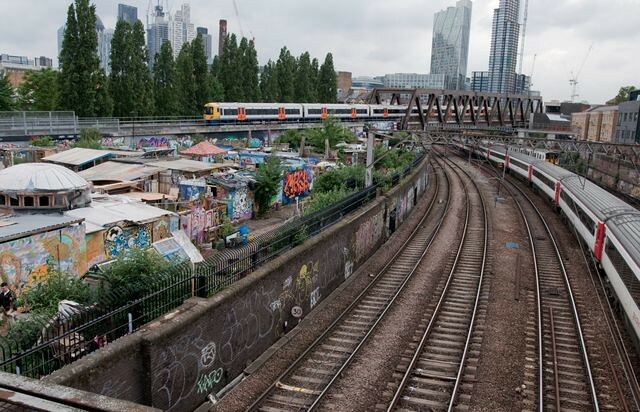 Development of the plot was not imminent so the Nomadic Community Gardens organised by Jimmy won permission to make use of the land for positive community purposes for a few years. The first thing Nomadic Community Gardens did was provide local families with small vegetable growing plots by placing raised soil beds on the ground, these have proved a big success and are still in use. 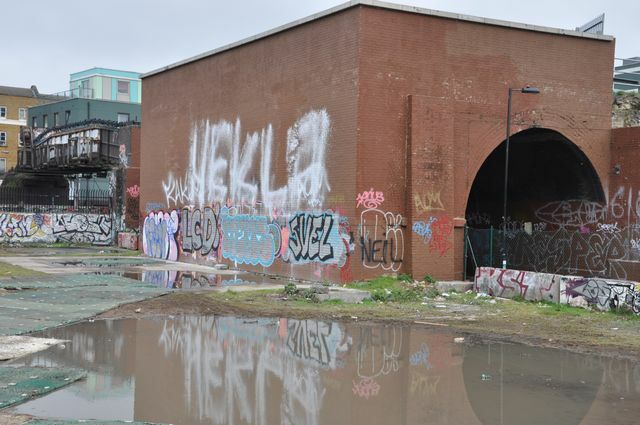 Over the years a variety of structures have been built using upcycled and re-purposed materials and these have provided a base for a variety of community activities and artistic endeavours. There is also now a lovely café on site, a great place to sit in the sun and have a quiet contemplative bite to eat. 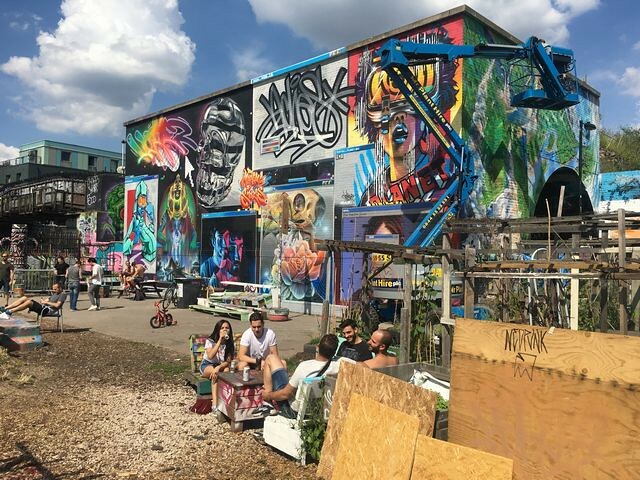 What has been achieved at Nomadic Community Gardens is quite astonishing and it actually contributes directly to the success of the Meeting Of Styles festival. 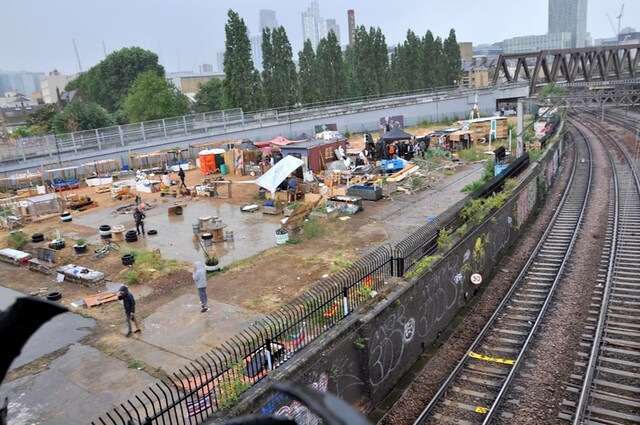 The converse is also true, the festival raises awareness of the Nomadic Community Garden space, not to mention a substantial amount of funds through voluntary donation. 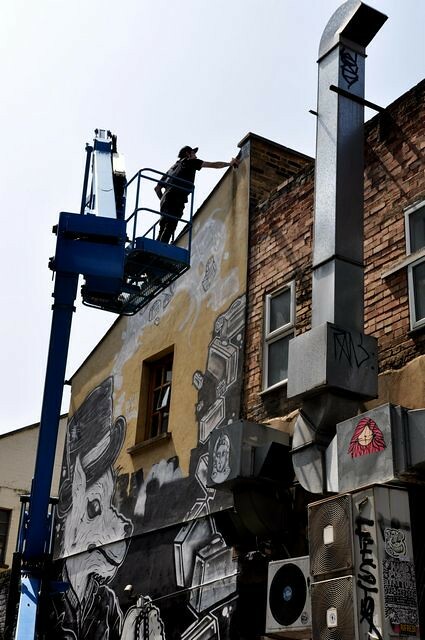 All this builds an environment where Meeting Of Styles can slot in without causing tension, painting takes place in and around a very chilled party atmosphere which in the daytime, importantly, is very family friendly. The Nomadic Community Garden location now feels incredibly organic, nothing like a “commercial” festival. 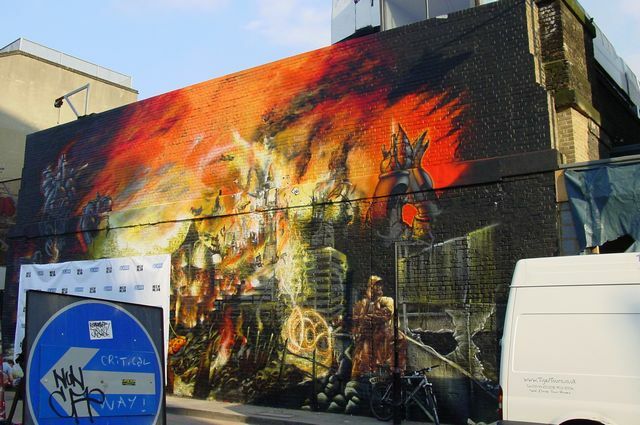 The early Nomadic Community Gardens editions of Meeting of Styles were actually rather sprawling affairs with walls being painted on far flung satellite sites, notably the Wheler Street Bridge, hoardings on Redchurch St and even the close to Old Street Roundabout. 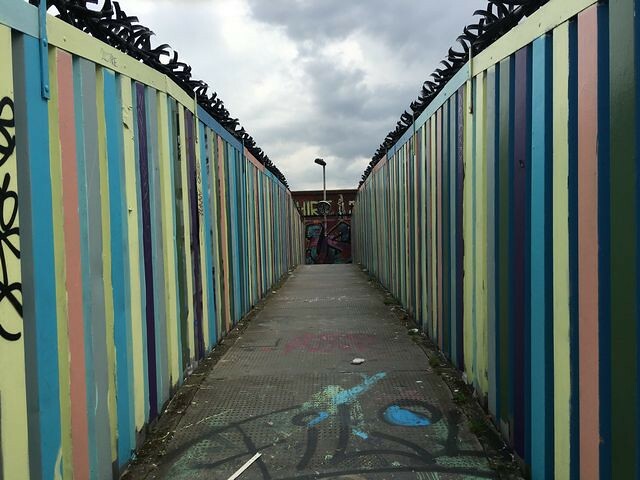 On this occasion all the walls were at or surrounding the Nomadic Community Gardens or on the Pedley St path that leads from Brick Lane to the gardens. This means it is easier to enjoy all the walls, no “the brilliant wall by that amazing painter I’ve waited all my life to see was a mile away and I missed it”; and it works for the artists too, that sense of a party happening elsewhere that they are not part of has gone. 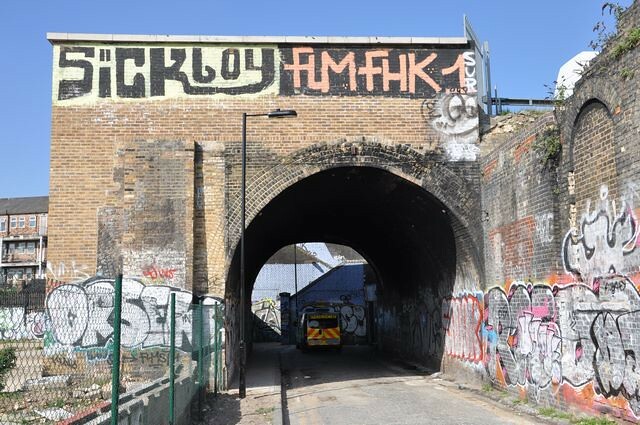 In past years there have been incidents with British Transport Police regarding the Meeting Of Styles festival, this year Network Rail turned up and participated in the painting and got a public thank you from Jim Vision, you couldn’t have imagined that 3 or 4 years ago. 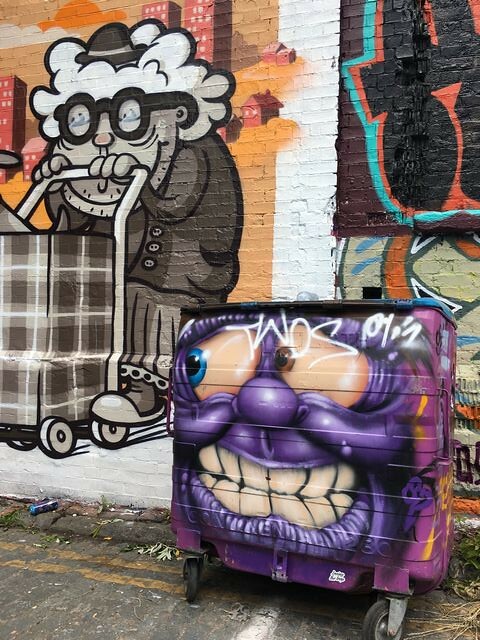 Another very noticeable shift that has occurred in the past few years is the street art element has increased significantly. 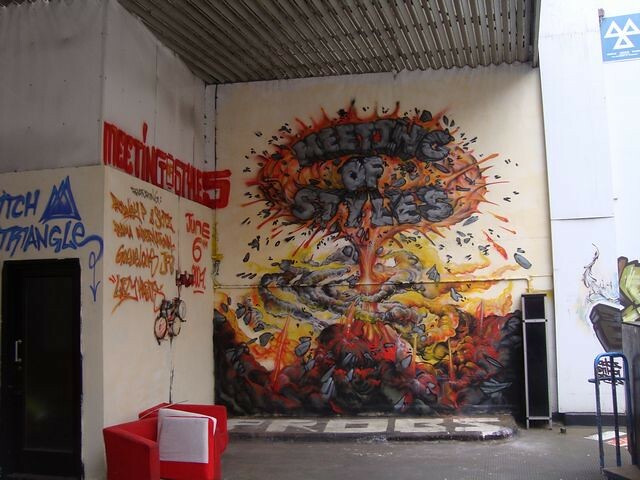 Meeting of Styles is an international organisation that has been going for many many years (some MoS sources say 1997, some say early 2000s) and it is letter based graffiti forms that dominate. 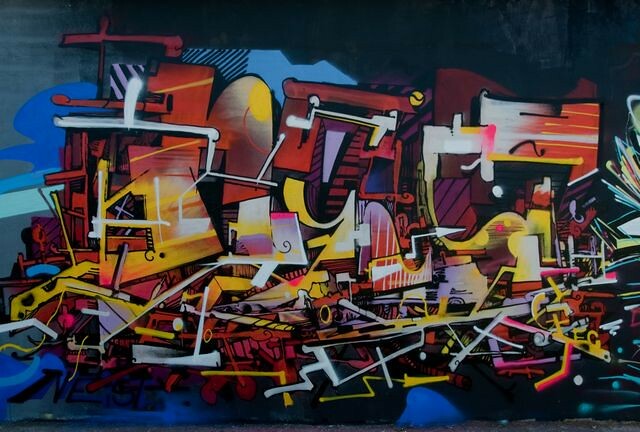 Looking back to 2008 and 2009, every named artist had a graffiti pedigree, today many of the contributing artists do not have a graffiti background at all. Some will argue this makes the walls more accessible, we say it all comes together and works wonderfully well. 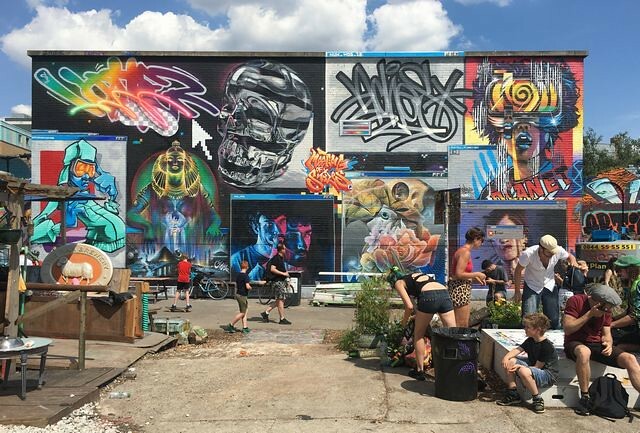 There was something in the air at the 2018 Meetings of Styles festival, and we are not just referring to the smell of spraypaint mingling with barbecue and assorted herbal fragrances, it was the combination of the great art, the vibe, the food, the music, the chilling with friends, the beautiful weather. 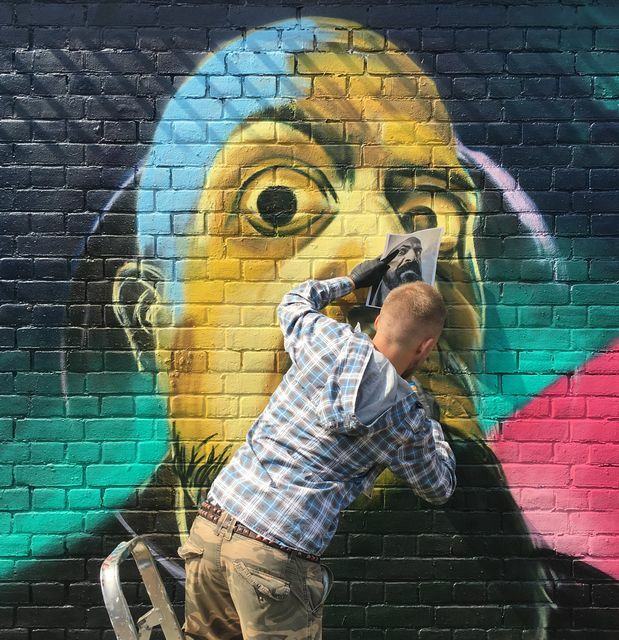 This squint at Meeting of Styles is a rather selective viewing, there are many other moments captured and artworks seen that deserve to be featured but there isn't room or time. 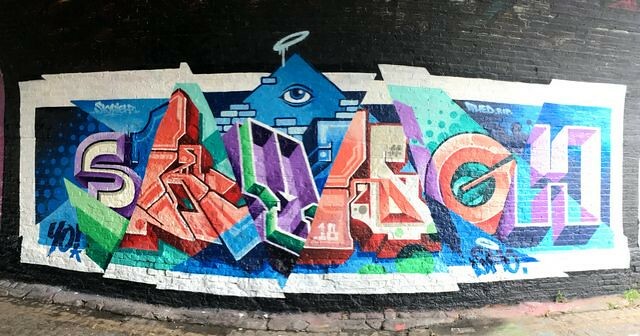 Also, there is the whole other music dimension of meeting of Styles but graffoto is home sipping its cocoa as that gets into full swing. 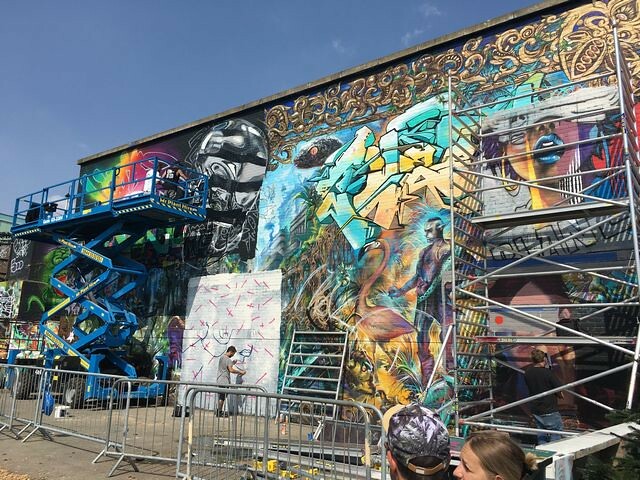 Meeting of Styles 2018 will go down as a great success and all of it depends so much on the brilliance of the many parties the combine in the organisation of the event but most notably, End of The Line. 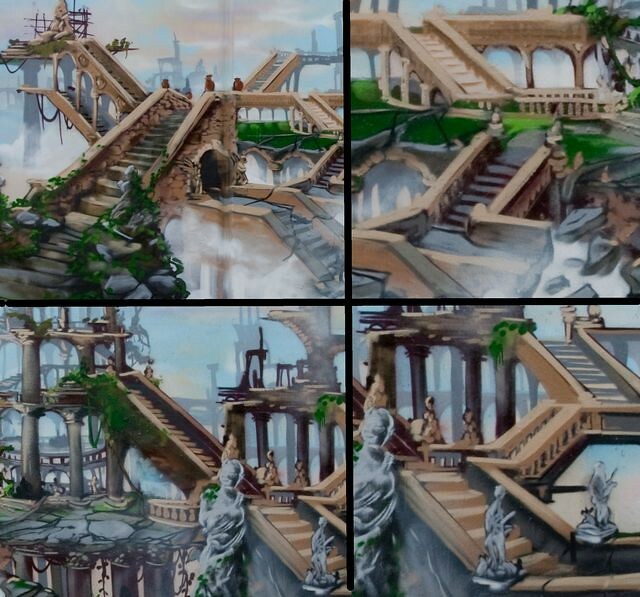 All of it, other than perhaps the sunshine though if that had not turned up someone would probably have painted it. When yer rabbit's got a gold toof, that's Hard!